↑ Miquelle, D., Darman, Y. & Seryodkin, I (2008). 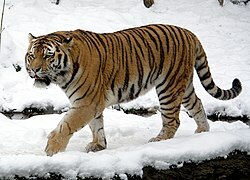 Panthera tigris altaica. 2008 IUCN Red List of Threatened Species. IUCN 2008. Retrieved on 23 March 2009.